If the lines coincide (in effect, they are the same line), then there are infinitely many solutions. Solution: Conveniently, both of the equations are given in slope intercept form. So we graph both of the equations in the coordinate plane. 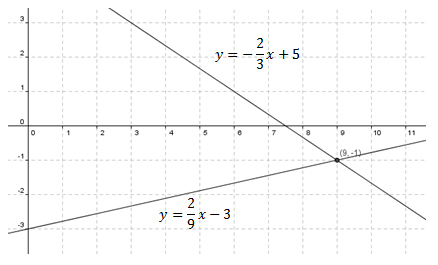 We see that the point of intersection between the two lines is (9, -1). Then (9, -1) s the solution to the system. 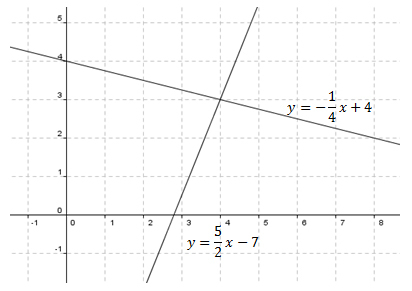 Here we can see that the point of intersection of the two lines is (4, 3). Then (4, 3) is the solution to the system of equations. You can always check your solution by substituting the values for \(x\) and \(y\) that you obtained into both of the original equations and see if you get a true statement. Sometimes you cannot solve by graphing because it is not precise. Then you will need additional methods to solve these systems. Solve each system by graphing.